The Photographic Art of Jerry Geist hangs in homes around the globe. We welcome you to our site and are certain that you will enjoy viewing the unique variety of photographs from one of the most beautiful places in America - Wyoming! Select your category from the left and take a visually stunning tour through the wilderness. Explore new territories, scenic vistas and spectacular wildlife to bring some of Wyoming home to your own walls. These beautiful scenes are available as studio-quality prints and can be purchased at the click of a mouse on our secure site. 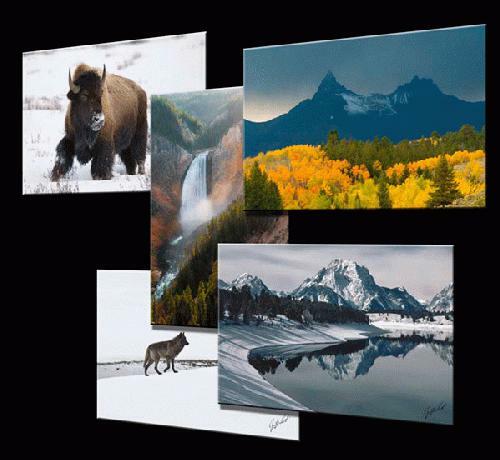 Display the awesome beauty of Wyoming in your environment today! Feel free to view your choices within the borders of a picture frame and perceive a look as it might be in your home or office. Frames are not included in the price of the prints, unless otherwise noted, but are available to enhance your viewing enjoyment. If you would like to be notified of new additions and specials associated with 'Images of Wyoming', sign up for our opt-in newsletter. It will be sent out on newsworthy occasions. Don't forget to check out the new blog. To keep current, you can sign up for email updates sent out whenever there is a new post online. Click here to visit the new Images of Wyoming blog and enter your email on the Feedblitz link for email updates. We hope you enjoy your photographic tour of our favorite place and again. Welcome! Be sure to visit our new News and Events Page for the latest information about Images of Wyoming. Thanks again for visiting. Our website is constantly being updated with new images, and now a brand new page called News and Events. On this page you can get the latest news flashes about what is happening at Images of Wyoming. There is a lot to read and much to expect. In this section you will find additional information about my work, gallery openings, newspaper and magazine articles, and upcoming events like the Casper Heritage Expo. See examples of our panorama images, some of which now reach a whopping 45 feet wide. You will also be introduced to those who continue to be significant influences on me and my work. I'll also introduce you to my family, those who are an important part of Images of Wyoming. Now, in addition to the News and Events page on the website, you can subscribe to my new blog called Images of Wyoming. It can be found at http://imagesofwyoming.blogspot.com. I try to write stories of interest to photographers that visit Wyoming, tell some stories of past experiences, some of which will include Bear stories and experiences I had when spending time trapping Grizzly Bears in Wyoming. You can read about the equipment I use, and also get the stories that come from newspaper and magazine articles. Something neat is the ability to subscribe to the blog's updates via email. It is an easy way to keep current with all the changes that happen weekly on the blog.